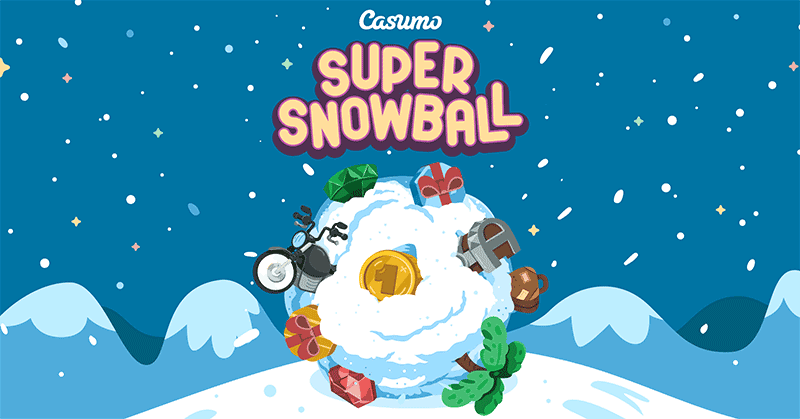 Casumo’s Super Snowball Promotions begins – Daily Prize Chests, Weekly draws, prizes up to £10000! Casumo Casino has just launched their massive Christmas promotions titled Super Snowball which offers players daily prize chests which can also be upgraded to much better rewards when depositing along with the chance to enter some amazing prize draws each week with Tech Gadgets, Holidays and Cash prizes of up to £10,000 on offer! The Super Snowball promotion kicked off on the 27th of November and runs for 50 days ending on the 16th January 2018, to take part firstly you need to be registered at Casumo. Once registered you can then start opening your daily reward chests which contain various valuables and goodies, these treasure chests begin as a Wooden Chests but can be upgraded to Silver, Gold and Diamond Chests when you make a deposit at the casino, the larger the deposit the better rewards (full details below). To enter the weekly prize draws you need to collect 5 Snowball Tokens, you start with 1 token each and have 4 more to collect from depositing. When you make a deposit of at least €/£20 you will learn 1 Snowball token (max limit of 1 token per day), so you basically need to do this 4 times in a week to be eligible for the main prize draw. Looking for more Xmas Offers? then be sure to check out our dedicated page for Christmas Casino Promotions page for 2017, covering the biggest and best offers that are running this year. Sign up to Casumo Casino. Promotion runs from the 27th November 2017 to 1st March until the 16th January 2018. Open Daily Treasure chest each day during this period. Upgrade Treasure chest when making a deposit at the casino for improved rewards. Earn Snowball Tokens to gain entry to the weekly prize draws when depositing. 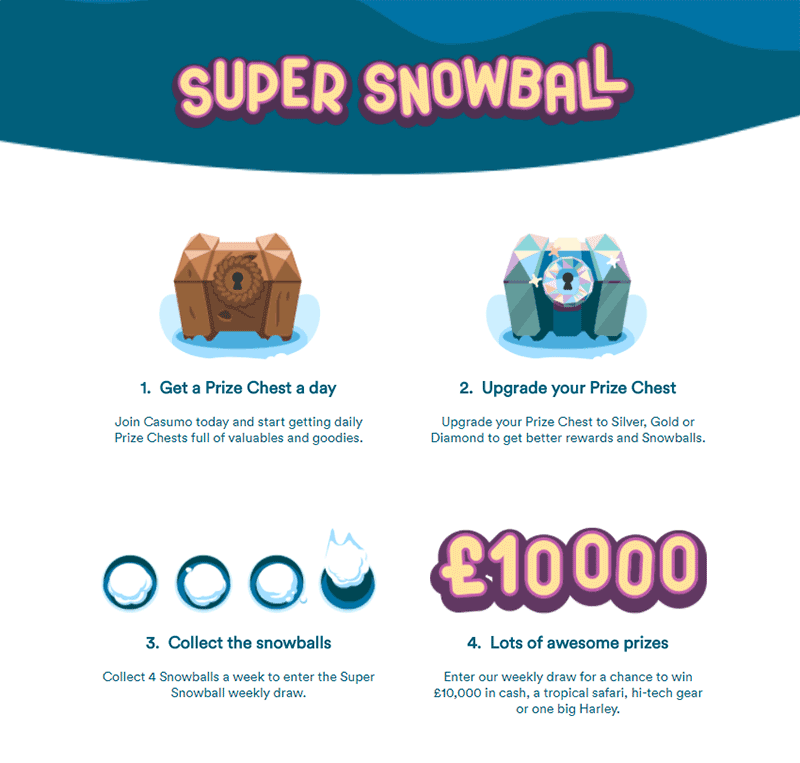 Take part in the Super Snowball Promotions! When you log in each you day will receive a Wooden Prize Chest which contains valuables and goodies such as Free Spins or a Deposit Bonus valuable. You can upgrade the Treasure Chests when making a deposit at the casino and the rewards inside are upgraded dependant on how much you deposit at the casino as follows. The upgraded rewards can include better deposit bonuses, super spins (high-value free spins), cash valuables and can be claimed once per day. As an example, for a deposit of £100 today, we received a £50 cash bonus valuable from a Diamond Prize Chest and some extra spins. To compete in the Weekly Prize draws you need to collect 5 Snowballs and these are received when making a deposit at the casino and claiming any of the upgraded chests listed above. These are registered in a special snowball meter to help you keep track of how many you have collected each week. You start each week with 1 Snowball Token and need 4 more (5 in total) to be eligible for the weekly prize draw. The weekly prize draw prizes change each week, the full prize schedule is listed below.